Kids Fun Day – Paws & Claws Adoptions Inc.
Kitten and puppy cuddles, kids crafts, sausage sizzle and a bake sale. What more could you want on a Spring Saturday! 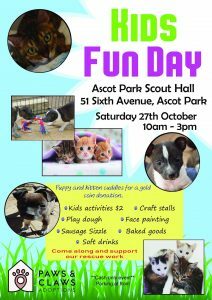 Come on down to Ascot Park Scout Hall and help support Paws & Claws Adoptions rescue work.